Have you ever wondered what you can and can’t put into a skip bin? 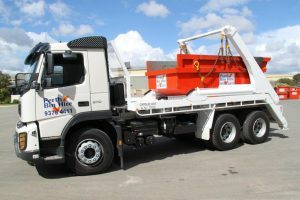 The last thing anyone wants to worry about when hiring a skip bin is being left with a nasty bill for dumping items, like chemical waste into their Perth skip bin when they’re not supposed to. But, the rules surrounding safe waste management and skip bins aren’t necessarily well known. So, to make things a little easier for you, we run through what you can and can’t throw in your skip bin in Perth. Whether you’re looking for commercial rubbish removal in Perth or residential skip bins to help with your home clean-up project – Perth Bin Hire can help! However, when you hire one of our bins, there are a few rules you’ll need to follow. These include not overfilling your hire skip bins, and also not filling them with any prohibited waste, like paint cans and asbestos. This handy info-graphic outlines everything you need to know! One point that is definitely worth highlighting is that not all types of rubbish can be thrown into a skip bin. The following items cannot be disposed of in a skip bin in Perth. So, to sort out your commercial and residential waste needs, be sure to contact Perth Bin Hire today! We’ll not only deliver the skip bin straight to your requested location, we’ll also remove it in a timely fashion, and sort your waste and recycling for you!